you know you’re deep in the “hockey parent” life when you find yourself at your local hockey arena helping to lay down the lines. 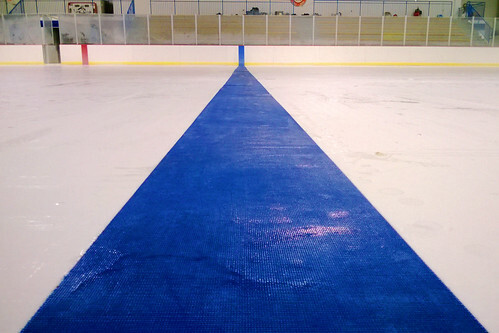 a few layers of ice have been put down and a few more will be put down on top of the lines. the blue line is relatively easy as it’s continuous cloth fabric, but still, it’s a little nerve wracking to get it perfectly straight! 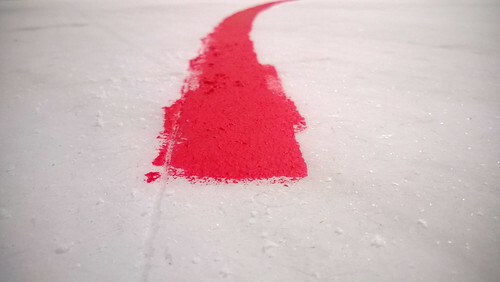 the faceoff spots are even more nerve wracking to do because they’re painted in by hand and painting on ice is an art not for the faint of heart! Previous Postkeeping up with the joneses – the hockey edition.Next Posthappy bartolome day!